I love a good decor hack. Especially when it only takes 5 minutes to make! 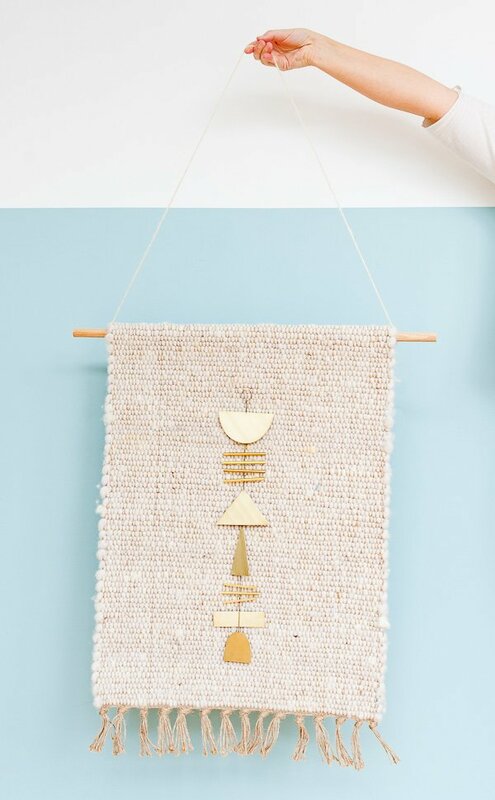 So, today I’m sharing a wall art / weaving hack that you can complete in basically no time at all! Right now I have this guy hanging up at the house. Recognize it from my recent guest bedroom makeover? But it’d also be a cool gift for any creative friends or family during the holidays, birthdays, housewarming gift, etc. 1. Start by cutting a dowel rod down to size. You’ll need the dowel to be a couple inches longer than your weaving width on both sides. See photo for guide. *If you measure ahead of time, you can have the dowel rod cut for you at a hardware store, as long as it’s over 12 inches. 2. Next, flip rug over (good side facing the ground) and place dowel rod approximately where it will be. Then add a strip of stitch witch underneath the dowel rod. Again, as shown. 3. 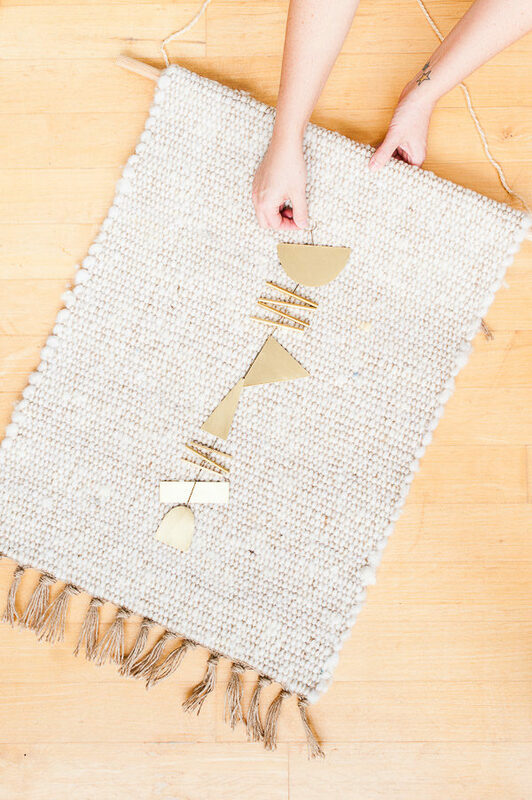 Heat up your iron, fold over the top flap of the rug and follow instructions on stitch witchery…basically just continue running iron over the top until the heat from the iron and bonded the two pieces together. 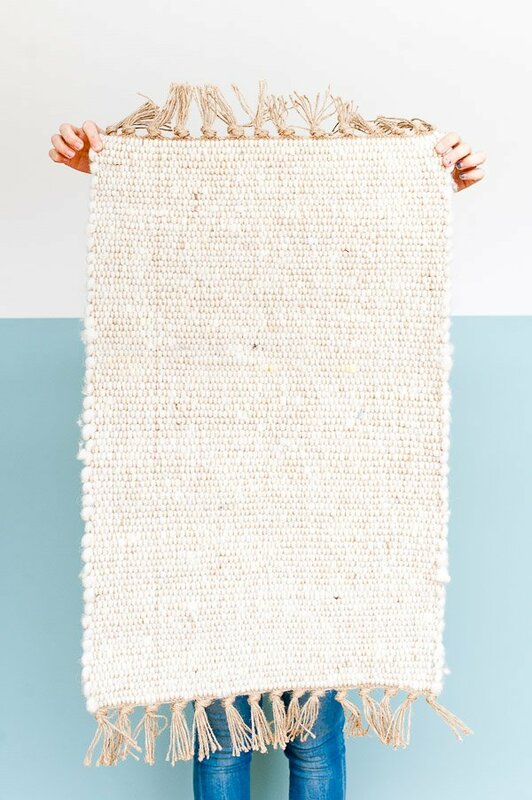 *If you have a particularly thick rug, you may have to use a needle and thread instead. 5. 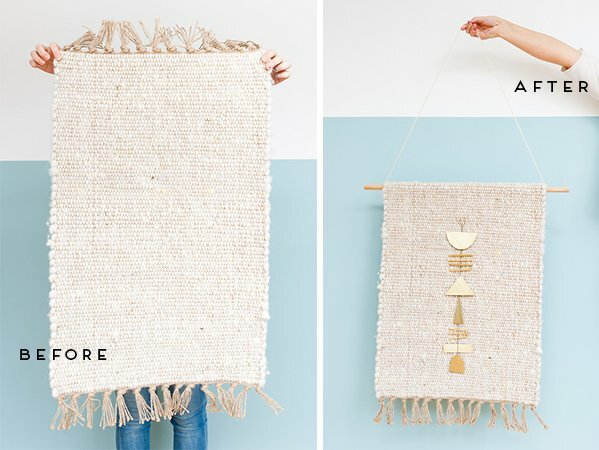 Using an extra piece of yarn, weave through a hole in the brass and a weaving opening in the rug, double or triple knot and you’re good to go. Super easy, right?! 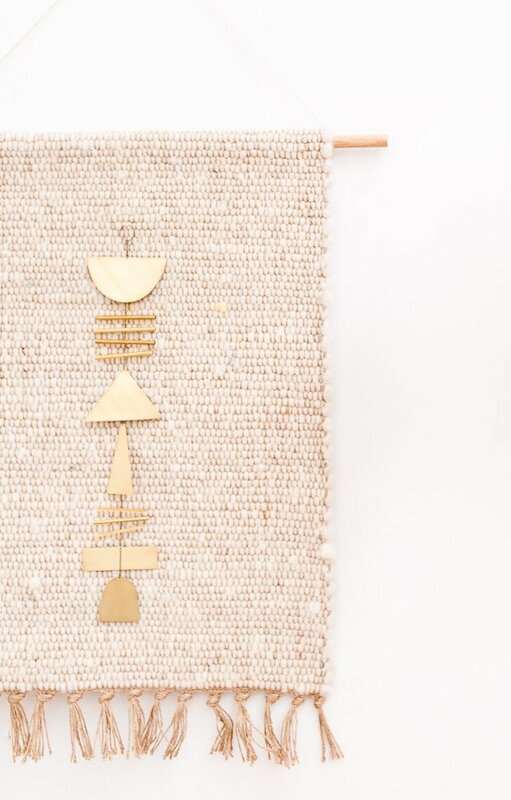 Can’t find a brass hanging sculpture like mine? 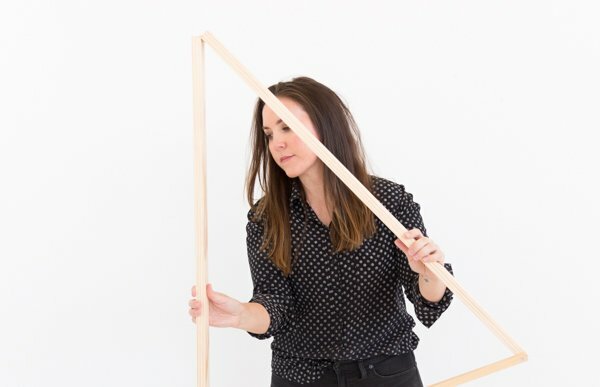 You can DIY your own! Just grab some thin brass sheets (or even copper sheets) and some handheld metal cutters and cut out shapes on your own, then punch a small hole through each one to string them together or attach them directly to your weaving. What do you think of quick decor hacks like these? Yay or nay? Let me know in the comments below. 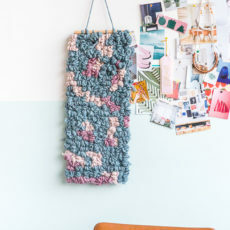 This idea is amazing, never thought of hanging up a rug! You should totally try it Michelle. SO easy! Love this idea, it looks amazing and so different! Right Megan?! So, so easy and quick! Love projects like that. So cool and so simple. Thanks a lot! This is a great idea and your photos are so nice!!!! Thanks for sharing! Hi Brittini, it’s easy time saver idea to make home decorative and amazing. 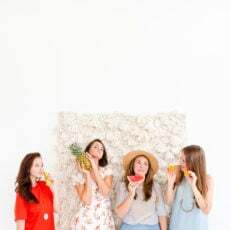 I must say this is a wonderful blog ever. 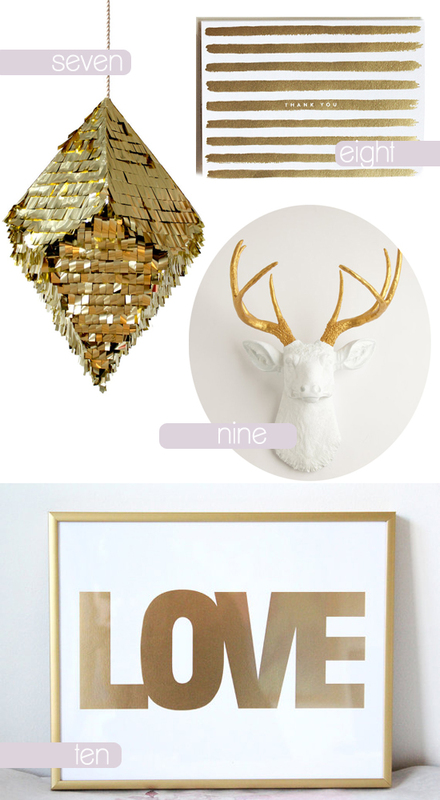 I will use these quick ideas for my home decoration. Please keep sharing. Such a great idea! Just came across this via Pinterest. 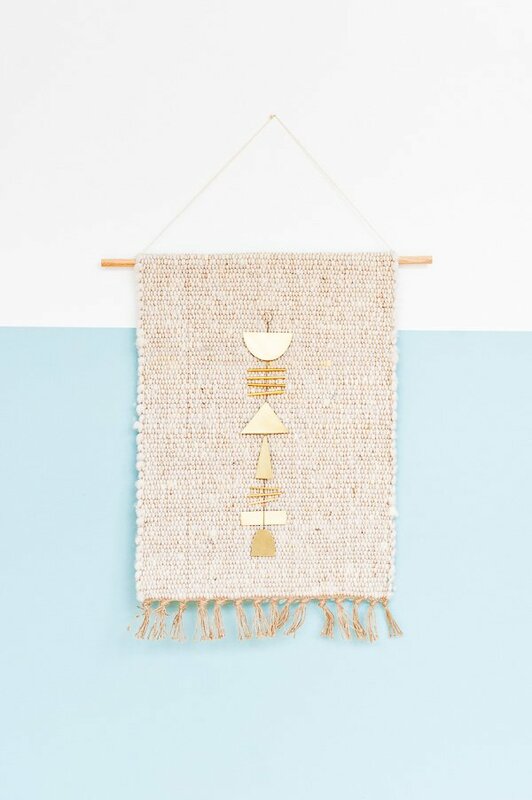 Where did you get you brass hanging sculpture? I bought it locally Courtney at a place called Citizen Supply: http://www.citizen.supply . I don’t believe it’s available online though.